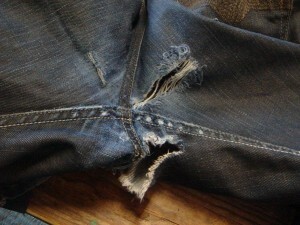 I just want to post a message about denim repair. That is right, this is what I do for living.? I? 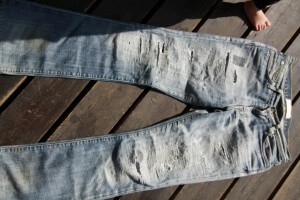 repair damaged denim and create damaged denim as well. You know…. I can do? both? repair and customizing. You send me pair jeans? 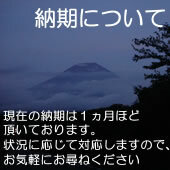 to Japan and I will work on them and send them back to you.??? I know it is not cheap to send pairs (about $15 from USA) ,? I can promise you to get the best quality in the world. Here is an example of my work …. 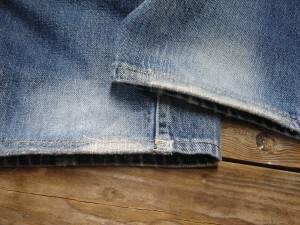 I will normally put extra thread underneath and very thin patching.? Carefully choose the matched thread colour and sew over and over. 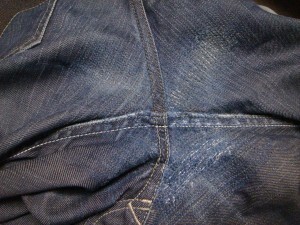 Darker colour denim is much harder to repair as the colour of the jeans tend to be one colour.? As they get worn out, the colour gets easier to blend in. Here is another example of repair work….. Hem!!!? This is very common place for repair.??? You always want to keep the length just right……? not too short, not too long. 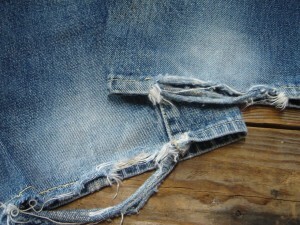 I will take all the hem stitch off and make it into one fabric first, and then repair the damage and stitch back. This way will take more time and money, but the result is great. Sorry about the photo angel. 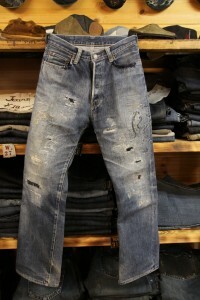 The pair is a brand called Paper Denim. Like it says, the fabric is very thin like paper.? There were a few holes when I received them , so the owner asked me to put some more damage and create new designers look. I added major damaged treatment on the front panel and patched with variety of? fabrics.?? You can see the fabric underneath. As I try to use thinner thread and patches, the feeling is totally great.? You will know it when you put them on. If you are looking for hand made warm texture and design, it is worth of try. By the way, they will blend into your closet too.